Last month we shed light on a new trend that has the potential to cause some serious wifi problems if not supported correctly. Of course we're referring to the new feature you might on your smartphone called Wi-Fi calling. 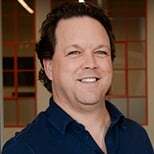 In part 2 of this whiteboard series, Senior Network Engineer Michael McNamee, explains exactly what features your wireless network will need to properly support Wi-Fi calling. Hi, my name is Michael McNamee. I'm a Senior Network Engineer here at SecurEdge Networks. 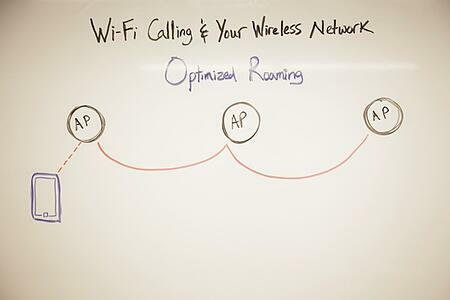 Welcome back for part two of our Whiteboard Series on Wi-Fi calling and your wireless network. Today, we're gonna be talking about the functions or features that your wireless network are going to have to have in order to accommodate optimal or high-performance Wi-Fi calling. 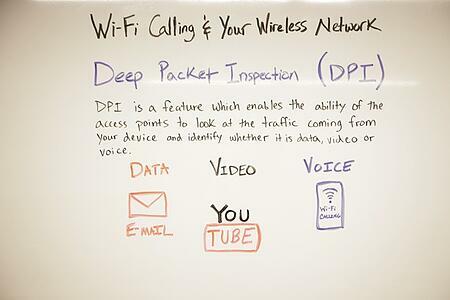 The first feature that I wanna talk to you about that is going to be necessary to accommodate Wi-Fi calling on your wireless network is DPI, or deep packet inspection. What deep packet inspection is it's the ability of the function that as the packets come into the wireless LAN system, it identifies it as a voice, a video, or a data packet. And what that does is it allows us the ability to give prioritization to the packet. So in the instance it's a voice call, we can give the highest level of priority. If it's video packet, we can give it the next highest or second level of priority. And data would be last or what we call best effort. In this manner, we can ensure that voice as a service is guaranteed to work. It works optimally on the wireless network. The next component that's gonna be critical to being able to host optimal Wi-Fi calling on your wireless network is WMM, or Wi-Fi multimedia. And what WMM does, it breaks down or gives these four categories to identify the traffic and give it some QoS prioritization. So again, we're seeing voice, video, best effort, and background. And based on the identification of the traffic, we can give percentages to these categories for quality of service or prioritization to the network. So again, we could guarantee or ensure a percentage of bandwidth to voice, another percentage to video, best effort, and then whatever's left over the background gets. And then this is applied to the wireless traffic before it ever hits the wire. 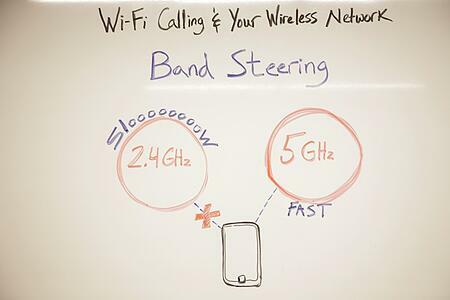 Band steering is another component you're gonna wanna have on your wireless LAN system to accommodate Wi-Fi calling. And band steering works in understanding what your device is capable of. So in the instance of a mobile phone, it's gonna see that it's dual-band capable. It's gonna keep it off the slow 2.4 network and coax it over to the five gigahertz frequency for better, faster speeds. 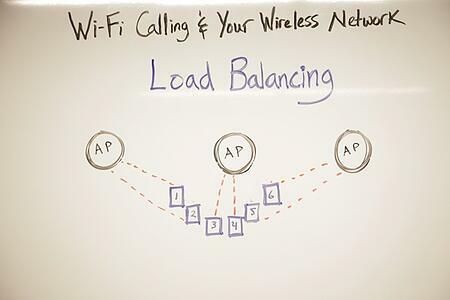 Another helpful component that your wireless LAN system should provide to enable optimal Wi-Fi calling experience is a feature called "load balancing." And the way a load balancing works is it looks at the device capabilities and looks at the APs in the environment and understands the client load. So in this example here, we've got three APs in a given space. Unfortunately, all six of the clients in that space have decided to connect to a single AP. What the system will do is it will disconnect the client devices and try to distribute them more evenly across the other APs in the space so that frequencies are freed up and processing loads that are distributed evenly across the APs. Since Wi-Fi calling clients are mobile, they're not stationary or static, it's gonna be important to have a feature like optimized roaming to help the clients maintain consistent call sessions as they roam throughout the campus or even a building. So what optimized roaming does is it...the ability of the system to identify the client connection from the AP to the client and then help it hand-off as it moves throughout the facility or the campus, to maintain a very consistent call quality throughout the entire session. The last component I wanna discuss when we're talking about Wi-Fi calling in your wireless network is an optimal design. Now, optimal design really isn't the function or feature of your wireless LAN system, but I do think it is crucial and critical to facilitating a good Wi-Fi calling client experience. 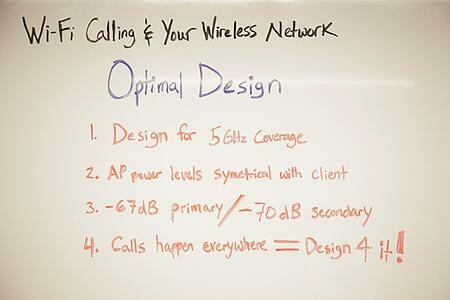 The first component in optimal design is to be able to design for 5 GHz coverage. This is gonna give you a cleaner spectrum and more channels for the Wi-Fi calling devices to use. The next item is AP power level symmetrical with the client device capability. So mobile phones have a much lower power profile than say, a laptop. So you're gonna wanna design with the AP power level set symmetrical with those mobile phone devices, not a laptop. The third component, or third item, is to design for a specific signal level in a primary and a secondary status. So our primary goal is to deliver negative 67 dB to the primary area, that a mobile Wi-Fi calling device would be in. And then the next 70 db, secondary area that as the device roams away from its primary cell, it's gonna be able to roam over to the next AP or the next cell fairly seamlessly. And then the last item, understand that calls are gonna happen everywhere. So with that in mind, make sure that you're designing for it. Your end-users are gonna surprise you with the number of places or the types of places they're making calls from, stairwells, maintenance closets, behind buildings. You know, potentially, even in the restrooms. Wi-Fi calls are gonna happen just about anywhere so make sure that you designed for it. 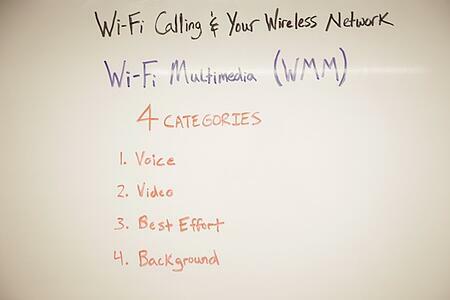 I hope you've enjoyed our Whiteboard Series on Wi-Fi Calling and your Network. In the description field below, I've included a link to our wireless LAN design kit. It will provide you everything you need to know before designing or deploying a large-scale wireless LAN. If you have any questions or comments for us, please leave them below. Again, thanks for joining us and hope to see you next time.